The Agency received a distress call at about 12.45am today regarding a fire incident at a story building Shopping Complex opposite Presbyterian Church, Yaba. This prompted immediate activation of the Agency's Emergency Response Team to the scene, along with the Lagos State Fire Service and officers from Sabo and Adekunle Police Stations. Inestigation conducted at the incident scene revealed that the fire started from one of the shop at the back side of the complex where wears, shoes, bags were burnt leaving 94 shops out of 201 in the complex destroyed. Owners were alerted and came on time manage to salvage some of their wares while the presence of the police team prevented lurking miscreants from looting products. No life was lost in the incident. A total number of 117 shops were saved. The General Manager LASEMA, Mr. Adesina Tiamiyu noted that the fire outbreak was exacerbated by the highly inflammable materials such as wears stored in the shops. 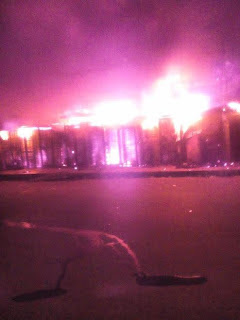 Also Air conditioners and Generators with fuel in the market caused occasional explosions as the fire raged the shops.